We have openings on our Leadership Team to oversee our Friday Night Gatherings. Media, Emcee/Production, Greeting, Set-up/Tear-down, and more! 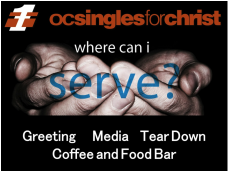 If you are interested in stepping up, please contact Pastor Thomas for more information at trose@ocsfc1.org. Do you consider yourself computer savvy? Or, would you like to learn? If so, we would love your help! Volunteers must be able to serve one Friday night a month from 6pm-10pm. Please contact Thomas at trose@ocsfc1.org to learn more. We have openings for this cool team called our Events Team! This team specializing in hosting great activities for our Ministry, such as hikes, dances, movie nights, Karaoke nights, retreats, potlucks, K-1 Racing Cars etc! For more information on how to join this dynamic team, contact Liz for more information at lmickelson@ocsfc1.org. Calling all Prayer Warriors! Our prayer team meets monthly on Friday night during our evening breakout sessions. Join us for scripture reading and focused time of prayer for individual and ministry needs. Please check our weekly newsletter for scheduled meeting times. "The prayer of a righteous person is powerful and effective." James 5:16. If you have a prayer request, please submit it to us, and we will pray for you. Contact Sue at slalwani@ocsfc1.org for more information.